Loving teenagers isn’t always easy. Some days it is actually really difficult. I had a tough Support Group this week. I did not walk away with a great feeling of accomplishment or even much hope. The conversations seemed to revolve around gangs, drugs, and baby mamas (yes, multiple). The students were distracted, disengaged, and at times disrespectful. In situations like this, it would be so easy to walk away and not come back. I am not forced to like these teens. I am under no obligation to see them again. But we don’t always have the choice to walk away. Many of us have teenagers in our lives that we have to spend time with. They live in our homes, go to our schools, are involved in our youth groups, and play on our sport teams. You are the right person.If you are already in the life of a teenager, there is no one more qualified to walk with them. Teenagers don’t always need new people to come and change their lives. They need the people who are already in their lives to notice them, invest in them, and encourage them. Maybe that means helping them find other resources, but we have to tap into the community that is already surrounding our students. It is a hard job, but it is your job! The right thing can be messy. If you are looking for the easy, clean thing, you might be looking for the wrong solution! It is right to stick it out in a Support Group that seems to be going wrong. Right is finding glimmers of hope like a girl talking about an attitude change that made her week better. That is small, and it didn’t get her out of trouble, but it is setting her on the right path. We don’t need to fear getting a little messy. I don’t know about you, but my life can be sticky, too. 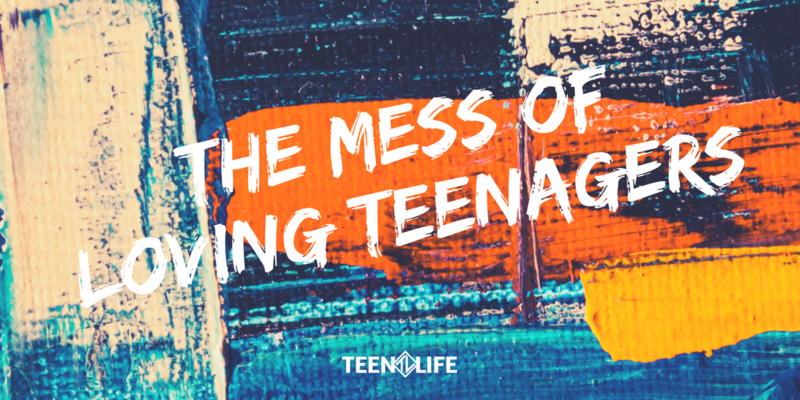 When we are dealing with other people (especially adolescents), it is always going to be messy, but it can also be right and good. It is the right thing to stay. What difference would we see in teen culture if the people in their lives chose to stay? If that dad didn’t walk out? Or that teacher didn’t give up? Or that friend didn’t kill herself? By this point, I think we can all agree that staying is hard. But the simple the act of staying probably makes the biggest difference. I could completely stop my group after a hard week, but it is so much more powerful when I choose to come back. I might not agree with their choices, I might not like the words they use or the topics they discuss, but I will continue to come back week after week. Every time you stay, come back, and reengage, you are sending the message that you care and that they matter. Teenagers need you. They need a community who will call them to a higher standard but stick around when they fall a little short. You are probably already doing this in your own context, but this is where Teen Life Support Groups can step onto a school campus and make a difference for a group of teens. For 8 weeks, we climb into the mess and keep coming back. Our volunteers ask the hard questions and encourage the small changes that make a big difference. We would love for you to step into the mess with us. We are wrapping up our Spring Fundraiser this week, but you can still give to help us provide groups to students who need support, consistency and a little extra encouragement. You can give here. Help us equip students and let us empower you to stay in the hard times!